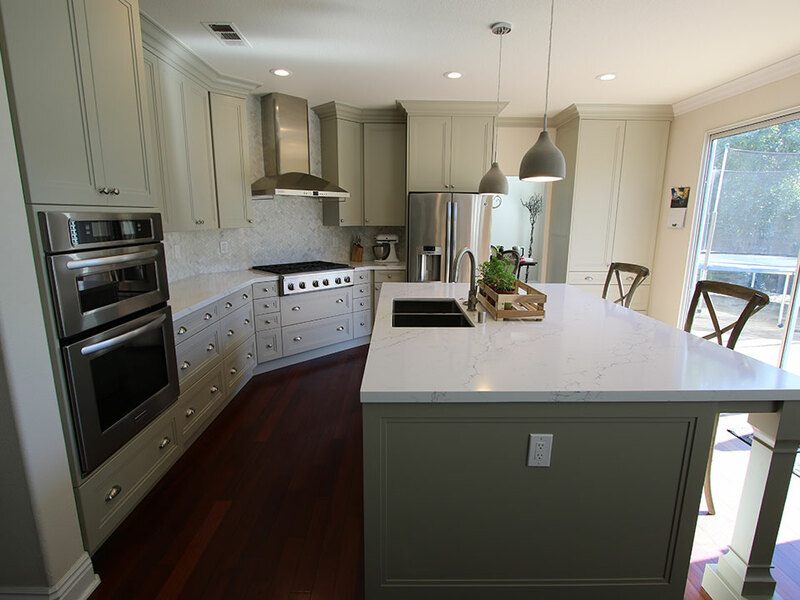 In the previous design, when you walked into this Tustin kitchen you were greeted with a space that felt very traditional and somewhat dark, with cabinetry that almost entirely matched the flooring, leaving very little visual contrast or distinctive design. Essentially, there wasn’t anything that was really customized or that stood out about the original design. 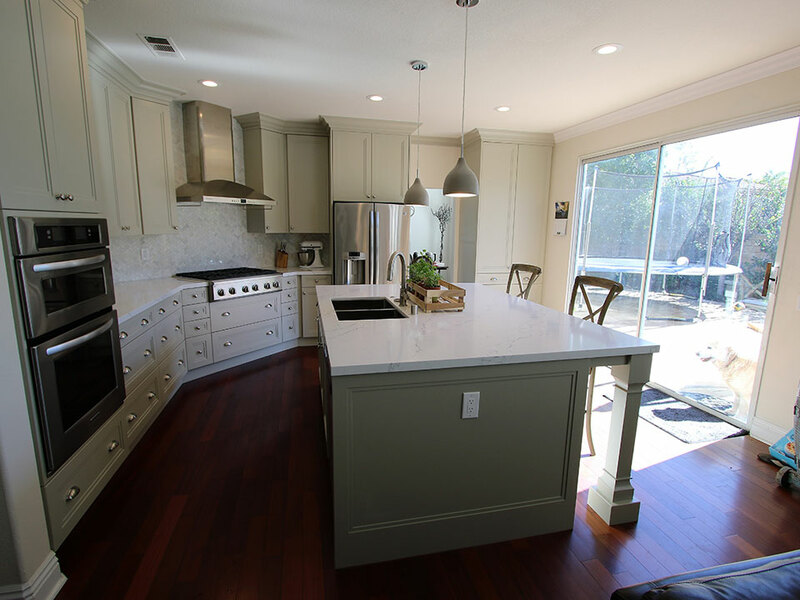 We did keep much of the original layout since it worked well for the homeowners, but we created a transitional design where the focus was on the beautiful, custom-colored cabinetry. 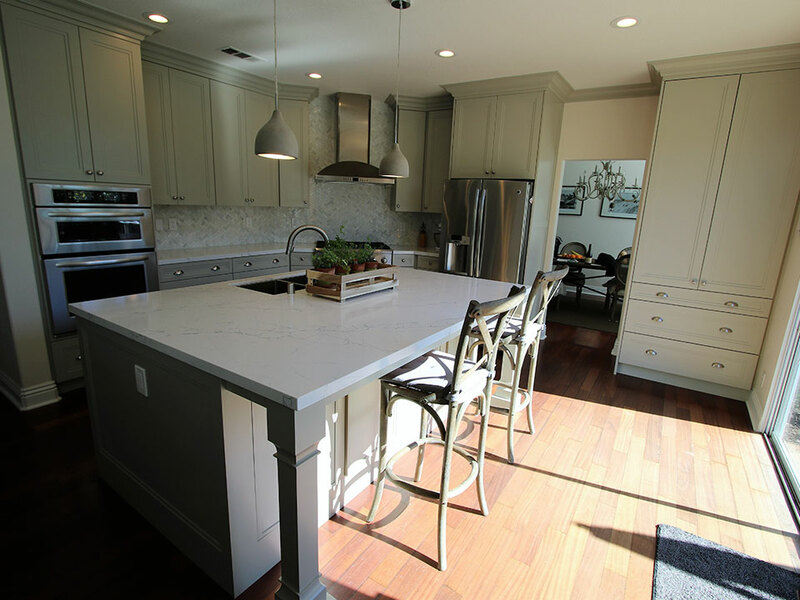 The cabinetry, which we brought to the ceiling and framed with a wide customized molding, features soft close details, and Craftsman 2 ½-inch door frames. 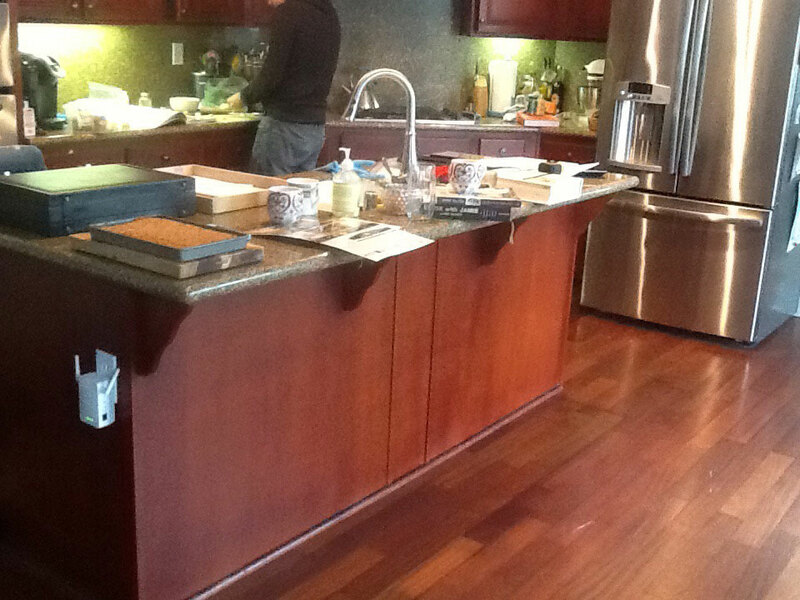 The cabinets remain along the perimeter of the kitchen and are maple construction. 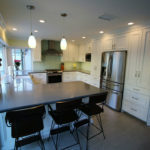 The truly unique feature of these stunning cabinets, however, is the color, which is completely unique to the homeowners’ design and is two shades later than classic Sage Green. The island is a darker contrasting color—true Sage Green. 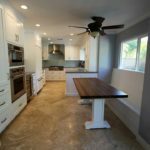 The island features a Craftsman design with flat molding and hand-crafted posts located as supports for the seating area. The herringbone tile backsplash is in varying tones of gray and white, and extends to the ceiling above the range and beneath the GE Monogram 36-inch wall-mount vent hood. This backsplash adds a touch of modernism to the design and feels chic and clean yet visually exciting. The white countertops feature subtle marbling patterns, and the island is where the Kraus double-basin 16-gauge exclusive undermount sink is located. This Tustin kitchen remodel also features a GE Monogram 36-inch cooktop, and a KitchenAid 30-inch electric built-in microwave and oven combination. 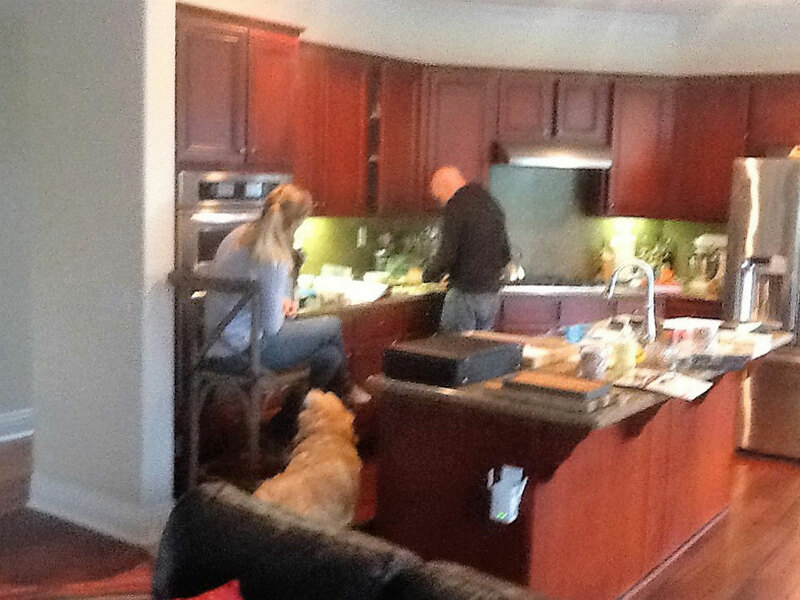 The cabinet and island designs were carefully planned to maximize storage, and a built-in pantry closet located along the side wall of the kitchen was revamped to match the color and style of rest of the kitchen cabinets. 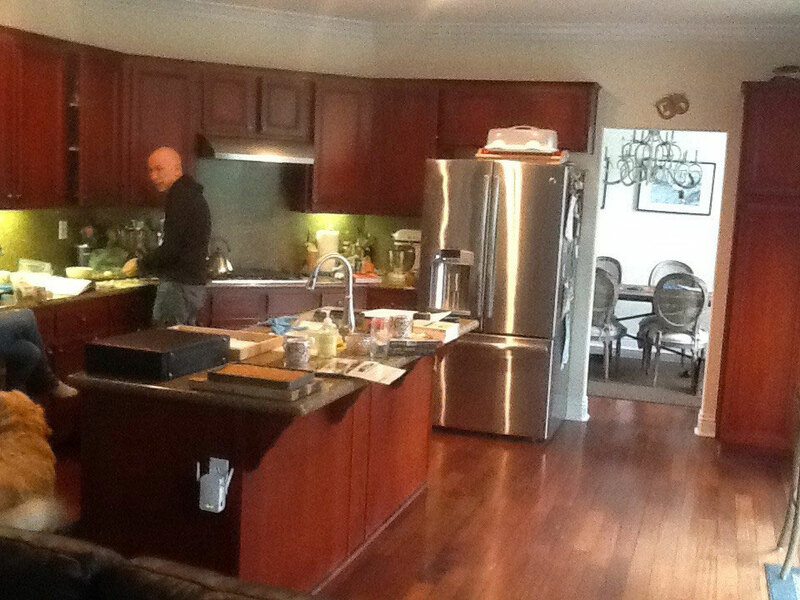 The pendant lights above the large island are another added bit of modern design that reflects the overall transitional concept of this kitchen overhaul.